Not a Normal Box of Chocolates for sale. Buy online at Zingerman's Mail Order. Gourmet Gifts. Food Gifts. I’ve never really offered a ‘normal box of chocolates’ and thankfully, that streak is still alive. This assorted box of pralines and caramels is anything but normal. Made by hand here in Ann Arbor by Cathy Selin, a transplant from New York City. Cathy does everything herself with painstaking detail. Her ganache alone takes four days to create. Each box includes almond pralines and burnt sugar caramels, fifteen pieces in total. Nestled in a handsome box, it’s a classic gift for any chocolate lover. 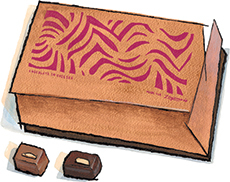 Aside from the Plaza Hotel and the Ritz Carlton, Zingerman’s is the only place you can find Cathy’s chocolates so check 'em out—quantities are extremely limited. "These are some of the best chocolates I've had in a long time. As I am a chocolate snob beyond belief and have written about chocolate for years, that is high praise indeed, but these chocolates deserve every bit of it. Beautifully thin shells, nothing too sweet or too salty, fantastic flavor balances, great textures; these are elegant, sophisticated jewels."